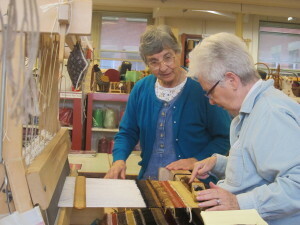 The following article, which was written by Marcy Gray and published in “The Hudson Independent” in July 2008, perfectly describes what The Weaving Center is all about. Also, watch the You Tube video. Here’s riddle: What was created by a nun, is called “a place of Zen” in which altar cloths and tapestries are woven to adorn churches and prayer shawls are made to celebrate a Jewish child’s religious rite of passage? It’s a place unlike any other: The Weaving Center of Tarrytown, which began 30 years ago in an empty carpentry shop at Marymount Convent and is under the passionate care of Sister Bianca Haglich, artist and teacher, sculptor and weaver, a Renaissance woman to all who know and admire her. 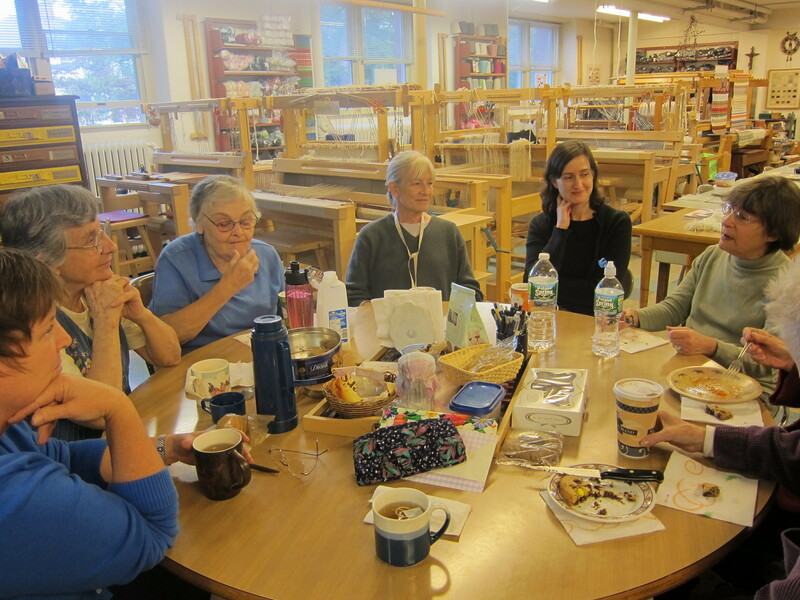 Sister Bianca began teaching sculpture and ceramics at Marymount College in 1950. 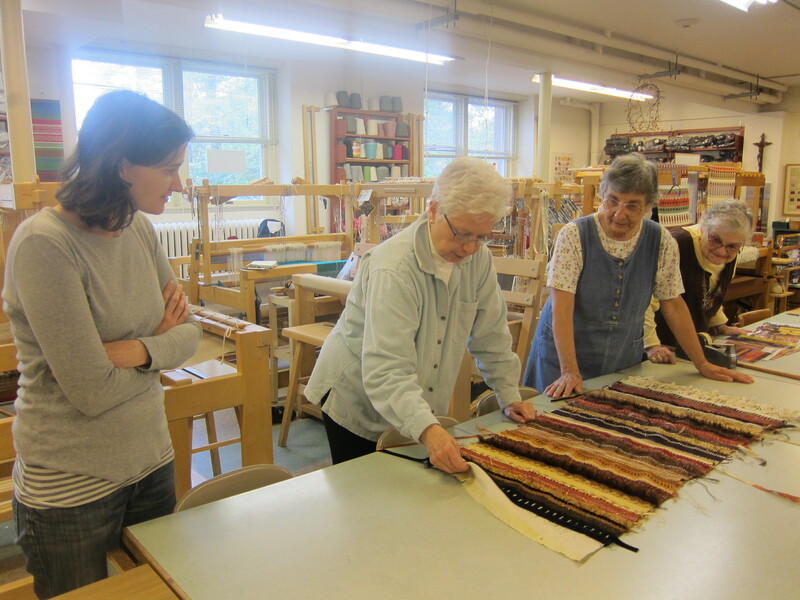 In 1968, she took a sabbatical to Finland, “the crème de la crème in weaving.” When she returned, she began her mission to bring weaving to the college, and in 1977 she found the center’s first space in the convent. With $2,000 from Religious of the Sacred Heart of Mary (RSHM) to buy four looms and yarn, the original weaving center was created. In 1993, the center moved to a location at the college. When the college closed in June 2007, the center had to move once again to its third and, hopefully, final home. In the end, they did not have to look far. Sister Bianca found that the convent’s old gym was being used as a storeroom and permission was given to transform it into The Weaving Center. “Now we’re at ground level with no more stairs to climb, we have lots of windows and light and we even created a weaving pattern in the floor tiles. What more could one ask for?” she said, beaming. If the language is poetic, it is fitting in the large space filled with natural light spreading over 20 wooden looms, each containing a glorious array of colors that signify hours of quiet and intense labor on the part of women, men, and the occasional child. “It’s like meditation,” said Faith Butterfield, a seamstress who took a three-week course from Sister Bianca. Butterfield has worked for 10 years at Van Cortland Manor, part of Historic Hudson Valley’s network of “living museums,” and had just finished her first work: a shawl that she will wear as part of her historic costume. 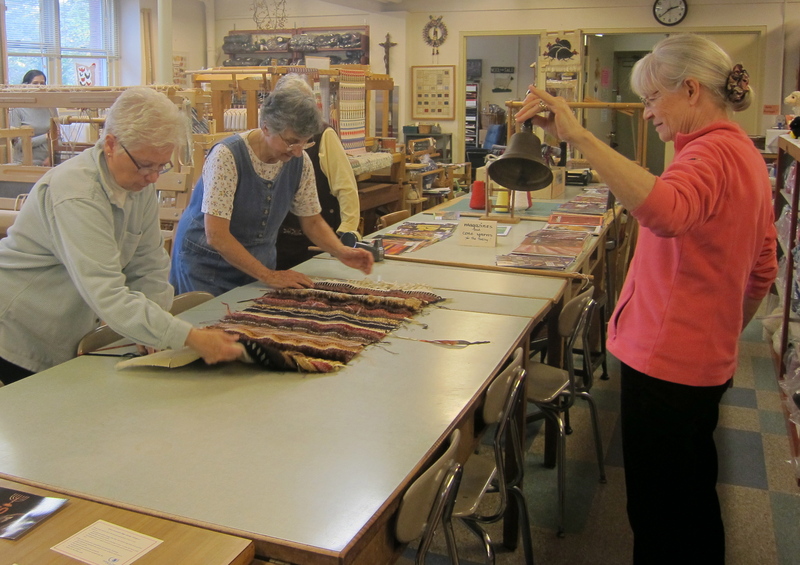 As it was taken off the loom, Sister Mary Alter, who has been with the center since its beginning, rang a bell to signify: This is an occasion. The loom Butterfield used will not remain empty for long: it is regarded as a “living, breathing entity,” said Sister Mary, “and it is not supposed to remain ‘undressed’ or it cries.” Poetic language again, which is suited to the surroundings. The center holds general workshops, one-on-one private instruction and sometimes formal tutorials in specific areas such as rug design. There is also a communal tea break at 3 p.m., which is by no means optional. “You need to take a break sometimes,” Sister Bianca said, with a gentle smile that brooked no argument.